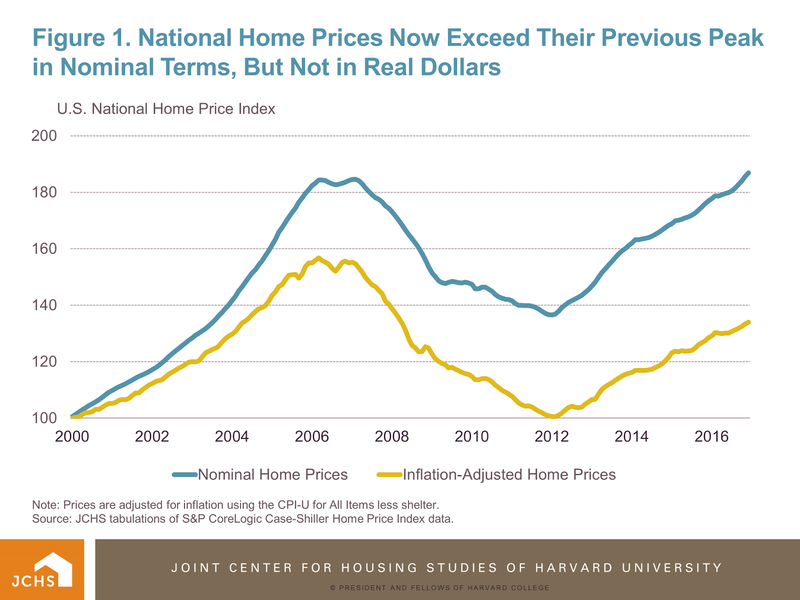 Housing Perspectives (from the Harvard Joint Center for Housing Studies): Are Home Prices Really Above Their Pre-Recession Peak? In 2016, national home prices not only rose for the fifth year in a row, they finally surpassed their pre-recession peak in nominal dollars, according to most national measures of home prices. However, as our new State of the Nation’s Housing report notes, when adjusted for inflation, home prices were still 9 to 16 percent below peak, depending on the measure used (Figure 1). Note: Prices are adjusted for inflation using the CPI-U for All Items less shelter. Source: JCHS tabulations of S&P CoreLogic Case-Shiller Home Price Index data. Moreover, as our interactive maps show, changes in home price vary widely across the country and often exhibit strong regional patterns (Figure 2). Figure 2. How Much Have Home Prices Changed? Our interactive maps give users the ability to view price changes in 951 markets across the country over two time periods—since 2000 and since each area’s mid-2000 peak. Viewable markets include 371 Metropolitan Statistical Areas and 31 Metropolitan Divisions (derived from 11 additional metro areas), which together contain about 85 percent of that nation’s population, as well as 549 smaller Micropolitan Statistical Areas, which are home to another nine percent of the population. The data indicate that nominal home prices were above their mid-2000s heights in 48 percent of all markets (454 total). These markets were largely concentrated in the middle of the country, the Pacific Northwest, and Texas. However, in real dollars, prices reached their peaks in only 138 (15 percent) of all markets. Furthermore, while prices were above peak in only 10 percent of Metropolitan Statistical Areas and Metropolitan Divisions, they topped their peak in 17 percent of the smaller micro areas, which experienced less home price volatility over the last decade. In contrast, real prices were still 20 percent below peak in about one-third of all markets, most located in areas hardest hit by the housing crisis, including Florida and large parts of the Southwest, Northeast, and parts of the Midwest. 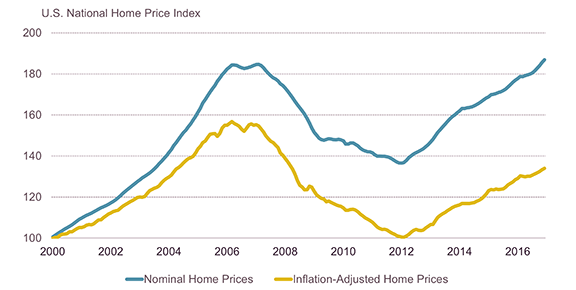 There were notable differences in long-term patterns in areas where real prices remained well below their pre-recession peak. In many markets on both coasts—such as Miami, Washington, DC, and Sacramento—prices have risen significantly over the last several years and, in real terms, are now well above their levels in 2000. However, because prices in these areas rose significantly during the boom years and fell so sharply during the recession, the recent gains have left prices far below what they were in the mid-2000s. In contrast, in some Midwestern and Southern markets—such as Detroit, Chicago, and Montgomery, Alabama—prices rose only modestly in the 2000s, dropped significantly during the recession, and have grown only slightly in recent years. Consequently, real prices in these areas were not only well below their peak levels from the mid-2000s, but remained below 2000 levels in many cases. The uneven growth in home prices over the past two decades has led to increasing differences in housing costs. Illustratively, in 2000 the inflation-adjusted median home value in the 10 most expensive metros (of the country’s 100 largest metros) was about $350,000, about three times higher than the median value of homes in the 10 least expensive metros. But between January 2000 and December 2016, real home values in the ten highest-cost housing markets rose by 64 percent to about $574,000, more than five times the value of homes in the least expensive areas, which grew by only 3 percent, to $113,000. A broader look at home prices further highlights these stark disparities. Nationally, real home prices rose 32 percent between 2000 and 2016. But home prices in 30 percent of markets (290 total) actually declined in real terms, including 28 percent of metro and 33 percent of micro areas, most of them in the Midwest and South. In the Detroit metro area, home prices declined 26 percent, the largest decrease among large metros. Prices also fell significantly in the Cleveland (22 percent decline), Memphis (15 percent decline), and Indianapolis (13 percent decline) markets. At the opposite end of the spectrum, between 2000 and 2016 real median home prices rose by more than 40 percent in 153 markets (16 percent), most of them on the East and West Coasts. In fact, prices doubled in twelve markets, including the Honolulu metro areas, which saw 104 percent growth. Home prices also rose considerably in the Los Angeles (97 percent), San Francisco (84 percent), Miami (73 percent), and Washington, DC (62 percent) markets. While micro areas were more likely to be past their previous peak, the lower price volatility also meant they experienced less price growth since 2000, with only 12 percent of micros exceeding 40 percent growth.